Pyramid has received ten Origins Award nominations for Best Professional Game Magazine (in 1993 and in 1995 through 2003). Pyramid won Origins Awards for Best Professional Game Magazine of 2000, Gamers Choice: Electronic Product for 2003, and Best Nonfiction Publication of 2004. 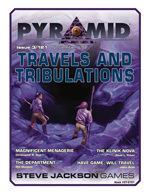 Pyramid was the monthly PDF magazine for serious gamers, created by serious gamers. 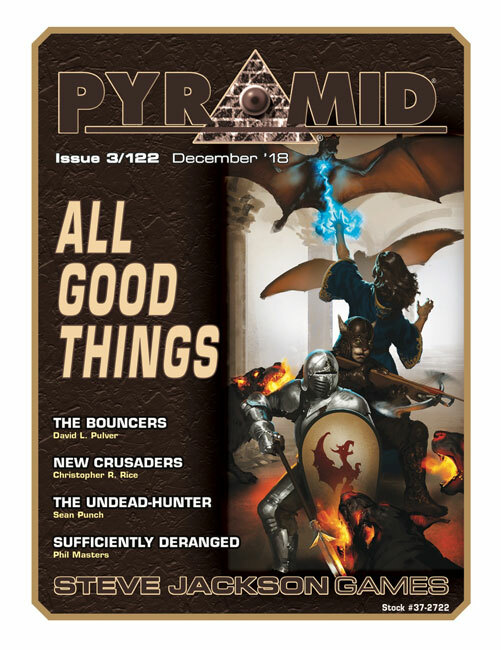 Each month, Pyramid delivered articles about a specific theme, from modern-day superheroes to post-apocalyptic gaming to magic on the battlefield. 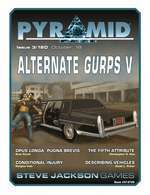 Most of Pyramid's articles are either generic, suitable for your game system of choice, or designed for GURPS, one of the best choices for serious gamers for over 20 years. This volume of Pyramid lasted for over 10 years, ending with Pyramid #3/122: All Good Things in December 2018. You can buy downloadable back issues of the original Pyramid volume from the 1990s, either individually or as a bundle of all 30 issues. 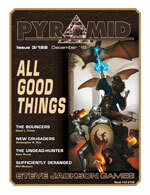 Each issue of the new Pyramid was devoted to one of three general themes: past, present, and future. Read what people are saying about Pyramid! What kind of articles does Pyramid carry? If you're in the mood for something fantasy themed, check out "On de Medici's Secret Service" from Pyramid #3/10: Crime and Grime, written by the author of GURPS Hot Spots: Renaissance Florence, Matt Riggsby. If you like modern-day adventure, download "The Temple of Sobek, the Crocodile God" from Pyramid #3/11: Cinematic Locations. 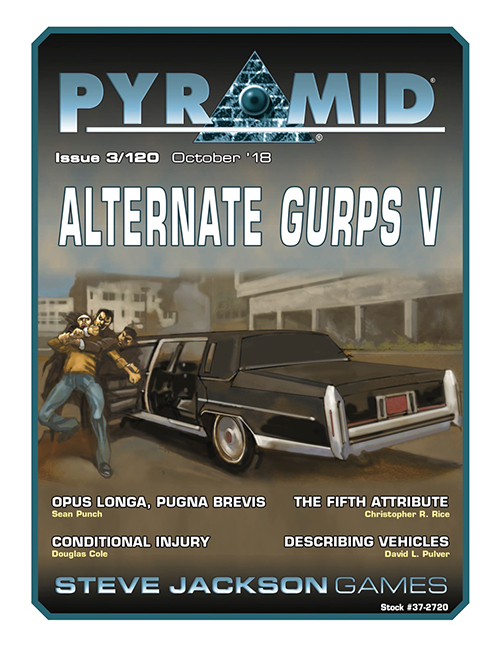 If you want to sample a futuristic article, try Pyramid #3/03: Venturing into the Badlands – Post-Apocalypse's "Deathball" – written by GURPS Martial Arts author Peter Dell'Orto and GURPS Line Editor Sean Punch. 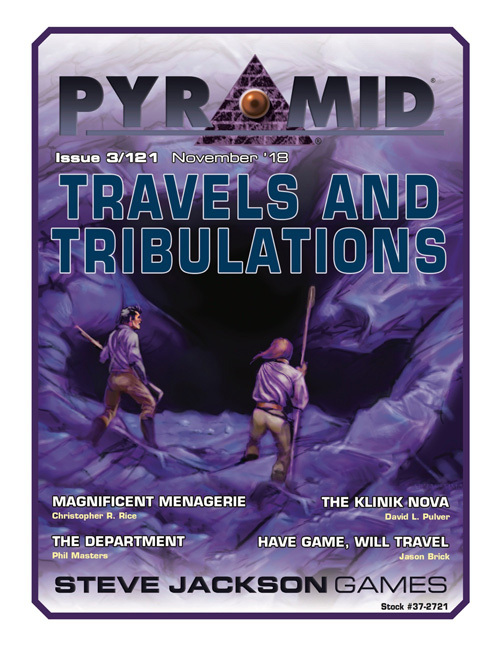 You can also check out the introduction and table of contents for any issue of Pyramid, available via Warehouse 23!